Feeling that it is incumbent on a teacher of Bible to stay current with media presentations of my subject, I went to see Book of Eli yesterday. Not really a fan of violent movies, I was a bit concerned about being subjected to gratuitous carnage, but beyond the expected post-apocalyptic context and its attendant, constant menace, there was not too much to worry about on this score. For several years I have been researching the presentation of the Bible in movies. It is my hope to write this research up into a book one day if I ever land a job that allows such a luxury. Book of Eli will deserve a chapter of its own. 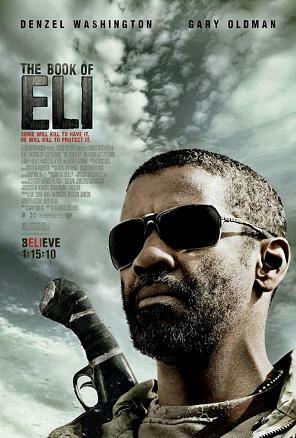 Apart from fundie self-praise fests, few movies present the Bible in such a heroic role as it plays in Book of Eli. Eli, like Jake and Elwood, is on a mission from God: to deliver a Bible to the last repository of education in the United States, namely a famous correctional institution. Along the way Road Warrior-style bandits harass him and Carnegie (a kind of deranged librarian with lofty political aspirations) covets Eli’s Bible, the last in existence. Carnegie wants the Bible because, “it is a weapon” of social control. (All quotes are approximate since I couldn’t take effective notes in the dark.) Eli must keep it because of his mission. Along the way Eli explains why the Bible is important to Solara, a young woman who is drawn to his sense of mission and devotion to the book. Explaining that since the last war, all Bibles have been routinely destroyed and that, “some say it [the Bible] is what caused the war,” Eli lovingly wraps the book in a cloth before secreting it in his ubiquitous backpack next to his machete. At this point I could feel the social commentary pressing hard upon me. The Religious Right would love nothing more than to force Armageddon on the planet so that they might go to their wonderful fantasy-land in the sky. Their misreading of the Bible has caused wars in the past and will likely cause them in the future. As Eli loses the Bible to Carnegie and continues his mission empty-handed he explains to Solara, “I’ve been protecting it [the Bible] so long that I forgot to do what it says.” Again the social commentary was evident as news headlines continue to push hot-button conservative political issues where the heart has been cancerously eaten from the Religious Right and the Bible as idol becomes more important than what it actually says. When Eli brings his mission to its conclusion, however, the viewer is presented with an entirely positive view of the Bible. It is the symbol of civilization in a world of anarchy and Solara marches off as its acolyte into a hostile world as the sun sets in the west. What is truly remarkable about this film is that it presents the Bible in a way that would make its study cool again (if it ever was). For those of us who’ve spent a lifetime shying away from telling others that we have spent our lives learning about the Bible, we might now walk into the glaring sunshine and have others step back in reverence for our selfless efforts to benefit the human race. Well, at least once the apocalypse is over. This entry was posted in Bible, Bibliolatry, Movies, Popular Culture, Posts, Religious Violence and tagged apocalyptic, Armageddon, Blues Brothers, Book of Eli, post-apocalyptic, Religious Right, Road Warriors by Steve Wiggins. Bookmark the permalink. Depends on what you mean by misreading. Some parts of the Bible are propaganda in favor of war. If you read it in an overall context to see all the diverse elements and view it as a messy tapestry put together by pack-rats who were content to keep the good and bad alike then you won’t use it to fuel a war, but if you were to literally believe Deuteronomy 13 as the inerrant word of God (especially to the exclusion of more loving passages) then you obviously would. Indeed! “Misreading” may itself be misread. I use it in the sense of going against the overall flow in this particular context. The Bible prefers a humane outlook, overall. The context helps explain (but does not justify) the messier bits.